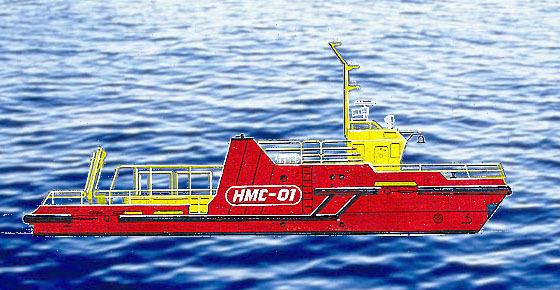 The new modification, Skimmer Design 50200, is a single-deck vessel with the engine room and wheelhouse located fore, the tanks for recovered oil - in the midship and the device of weir type for recovery of oil and floating debris - aft. Passage to oil spill sites and other movements over considerable distances the ODS performs by running, as usual, bow ahead using propeller screws. The speed of the ODS under usual voyage has been increased to 9 knots. The recovery of oil and debris is carried out when running and maneuvering astern under the influence of a water-jet propulsor with a rotating nozzle The capacity of tanks for the recovered oil has been increased two-fold and reached 40 cu.m. The tanks are equipped with a heating system, which facilitates the storage and discharge of viscous oil products. Improved is the system for cleaning entrained water that gets into the reception facility with the recovered oil. 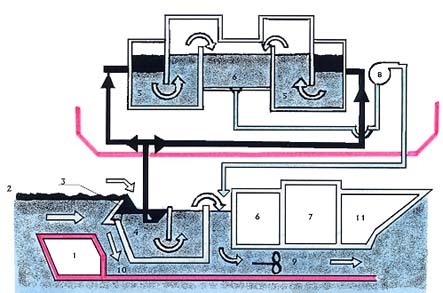 The floating debris that have been collected (wood chips, bottles, cardboard boxes, and other objects up to 75 kgs) arriving in the reception bath are separated from the oil, accumulate and are periodically removed by perforated scoop ashore. The additional portable equipment can be taken on board together with its attending personnel. The skimmer is equipped with seawater heaters for hosing down oil contaminated hydrotechnical facilities and rocks. The wheelhouse is equipped with a panoramic view, an air-conditioning unit, which is of great importance during prolonged oil spill response operations in the summer period and an improved heating system for winter conditions. The living and working conditions for the crew are significantly improved. 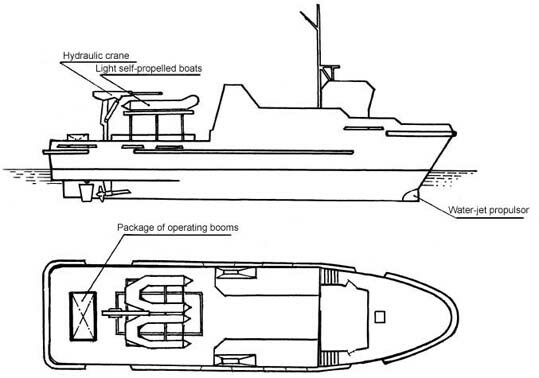 The vessel's passages can be carried out in seas up to 5 and over distances between the shelters up to 100 nm. The vessel's construction is in compliance with the rules of the Russian Register of Shipping and the requirements of the International Conventions.